Be the first to share your favorite memory, photo or story of Sallie. This memorial page is dedicated for family, friends and future generations to celebrate the life of their loved one. 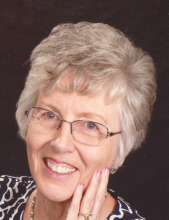 Sallie Joann Deges, 73, of Tuttle, Oklahoma formerly of Cheyenne, Oklahoma was born on October 27, 1945 in Elk City, Oklahoma to Joseph Arthur Jr and Arnetta June (Thomas) Andris. She went to walk with her heavenly Father on March 26, 2019 in Yukon, Oklahoma. She was raised at Sandstone and attended all her school years in Berlin, Oklahoma where she graduated Valedictorian of her class in 1963. Sallie married her best friend and sweetheart, Elmer Deges on March 28, 1970 in Cheyenne, Oklahoma. Sallie received her BS degree from Southwestern in Weatherford, Oklahoma and went on to receive her Master’s in Education. She was a school teacher for over thirty years. Sallie began her teaching career in Apache, Oklahoma but, then spent most of her time teaching in Cheyenne, Oklahoma where she retired. She enjoyed reading, traveling and watching cooking shows. Sallie loved doing crafts with her grandkids and going to watch her grandkids ballgames. Funeral services will be held at 2:00 p.m. Saturday, March 30, 2019 at the Martin-Dugger Funeral Home Chapel, Elk City, Oklahoma. Pastor Hainds Laird will officiate. Interment will be at Red Hill Cemetery, Hammon, Oklahoma. Services have been entrusted to the care of Martin-Dugger Funeral Home. Cherishing her memory is her husband of forty-nine years, Elmer; one son, Chris Deges and his wife Alicia of Wichita Falls, Texas; one daughter, Anita Wilson and her husband, Aren of Tuttle, Oklahoma; one brother, Tom Andris and his wife, Shirley of Blue Jacket, Oklahoma; two nephews, Tim Andris and his wife, Mandy and their family, Andy Andris and his wife, Heather and their family; four grandchildren, Jacob Deges of Lubbock, Texas attending Texas Tech University, Ben Deges of Canyon, Texas attending West Texas A & M, Cate Deges of Wichita Falls, Texas, Morgan Wilson of Tuttle, Oklahoma attending Oklahoma City Community College and numerous nephews and nieces. She is preceded in death by her parents, Joe and June Andris. Memorials can be made to the Breast Cancer Association in care of Martin-Dugger Funeral Home, P.O. Box 707, Elk City, Oklahoma 73648. To send flowers or a remembrance gift to the family of Sallie Joann Deges, please visit our Tribute Store. "Email Address" would like to share the life celebration of Sallie Joann Deges. Click on the "link" to go to share a favorite memory or leave a condolence message for the family.